A Trinidadian national who allegedly faked his own kidnapping was Monday morning remanded for obtaining ransom money. 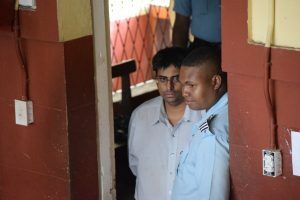 Thirty- three year Sawak Maraj, a mechanical engineer, who appeared before Chief Magistrate Ann Mclennan in the Georgetown magistrates’ court denied the charge which stated that that on October 27, at Madewini Resort Timerhi, he conspired with persons to obtain US$700,000 as ransom for a kidnapping. Police Prosecutor Alwyn Moore objected to bail based on the seriousness of the offense and that the defendant poses as a flight risk since he is a Trinidadian, if granted bail he would not return for his trial. Investigators had said that was reported that Maraj left CJIA in a taxi and was heading to a hotel on the East Bank Demerara when he disappeared. At the time, he was coming here to attend a job interview with Exxon Mobil. Sawak Maraj will return on November 16.